Discussion in 'Ateca' started by Tell, Jun 28, 2017. December I took it across the channel past Luxembourg with a few miles of unlimited autobahn into Trier and down the Mosel and back. This time it was going to stretch it legs a bit further across France, Belgium, Holland, Germany, Austria, Slovenia, Croatia and Luxembourg. A journey that turned out to be 3,000 miles including the UK element. The car, “a fully specified” 4Drive TDI190 DSG, less the towing bracket, which I ordered in the pre launch period in July 2016. Been driving “it” for the past six months. Bit like buying a computer system thought I’d go for all the extras except the tow bar. The “extras” are parcelled together so it is in any case difficult to separate out the bits you want with the bits that you might not want or don’t understand what they offer. It’s not really clear how useful some of the features are till you have tried them out – my excuse for buying £5,500 of extra features over the base price. North Croatia coast holds attractions for hiking on the island of Cres (trusty hiking guides Sunflower and Rother), but the co-drive a zoologist by training threw in the western wetlands of Croatia as a destination as well where the Danube over flows to create a large wetland nature reserve, Kopački Rit. 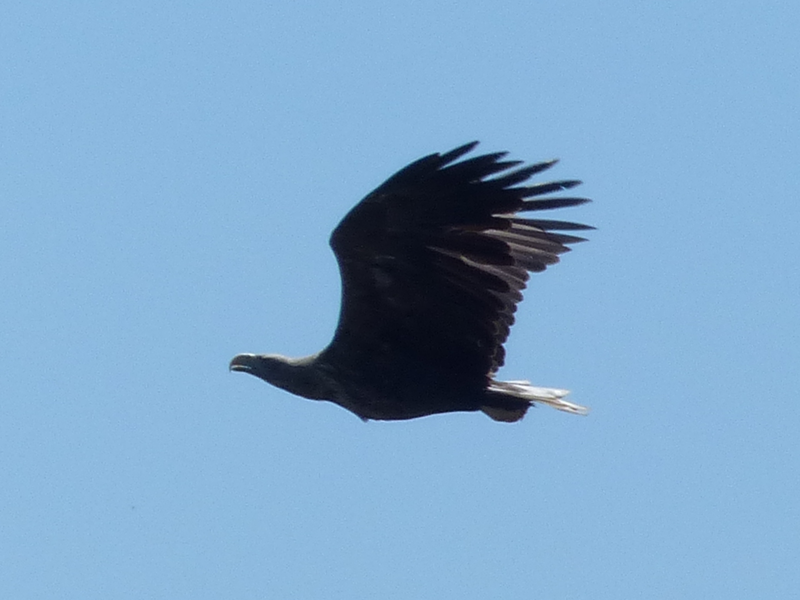 The breeding haunt of the white tailed eagle. Not too sure about getting the side of the car muddy agreed we’d visit that as well a six hour drive across Croatia on the border of Serbia. Due to landmines off road driving isn’t a good idea or hiking off trodden paths in certain locations in parts of Croatia, this is one of them. Saved going off road and yes we did see a marked out landmine field by the side of the road returning from Kopački Rit. On the outward bound sightseeing in Wurzburg in Germany to break the journey. 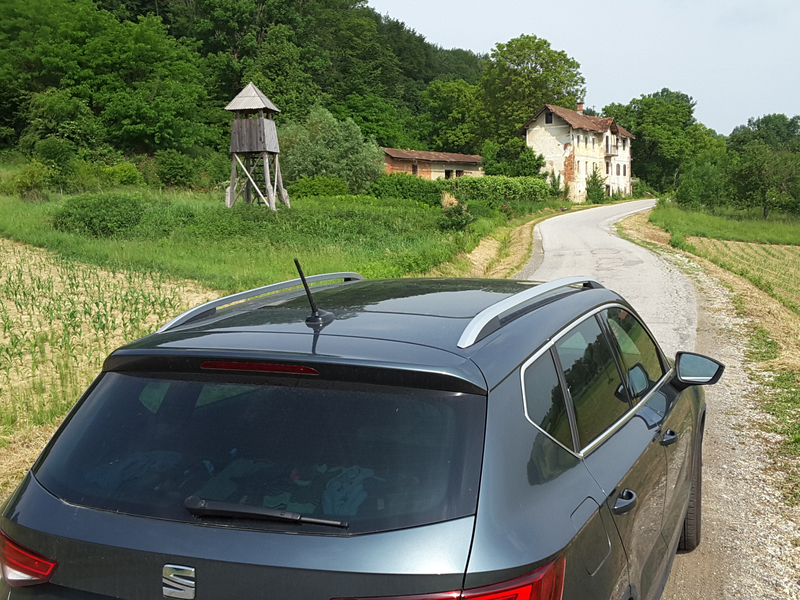 The return journey was more hiking in north east Slovenia in the wine growing area for several days. The EU site Urban Access Regulations tells you whether you need a special LZ pollution sticker for petrol and diesel vehicles that need to be displayed if you enter specific urban areas – none on this trip. Vignettes are required for travelling on highways in Austria and Slovenia. The normal placing of Headlight stickers for travelling abroad is a thing of the past with the Ateca LEDs as the light beam is angled to be within temporary legal restrictions for driving on the “wrong side of the road”. These are called Tourist Lights settings in the Ateca manual. You can wave off the guy that tries to sell you the sticky bits whilst queuing for the ferry, pull back the panoramic roof and enjoy the sea breeze. One of the treats of the sunshine roof. On the ferry you can disable the volume sensor and motion detector so the car doesn’t sound the car alarm if it’s a rough crossing. This is a rapid two presses on the key fod lock button… one of the few times you use the key fod if you move to totally hands free with the Kessy. The car’s manual shows a fantasy button in the door pillar for this, you won’t find it. It’s also worth noting that the sensors for reading the Kessy key’s presence in the car to prevent auto locking and indeed opening can be problematic at times so best not to close the last door or tailgate with the keys in the car. Sometimes one side of the car can refuse to open which may be due to the system powering down to save energy. 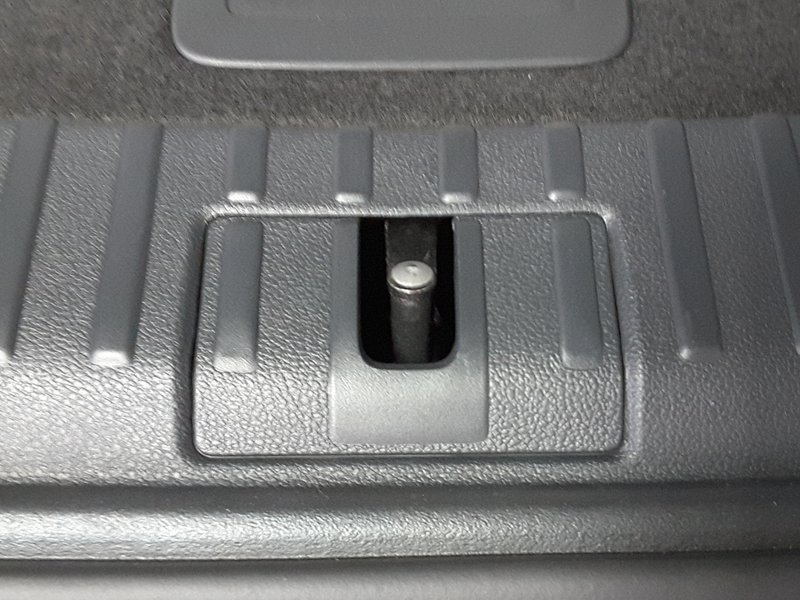 An emergency key lock is hidden on the drivers side where the actual key is inserted in a hole from underneath to flip off the plastic cover to reveal the barrel of the lock. That one is really there for if the battery becomes flat but it something you need to locate for peace of mind if you have the Kessy system. We took both keys on the trip and kept them on us. The Adblue filling strategy was upper most in my mind since I knew it was going to come up whilst away. Wanted to opt for a standard lorry fill pumps off the stuff rather than bottles, pipes, funnels and sloshing out of bottles. That’s the old way of doing it. It’s half the price at lorry pumps than Halford type of bottles and cleaner to fill, whilst garage fillups or necked bottles with valves is four times the price. Adblue pumps were not too common in Croatia according to the app. Fuel filling strategy, diesel is cheaper in France, Germany, Austria and in Slovenia and Croatia. Cheapest in Luxembourg. Auchan in Dunkerque was the first stop where I spied out an Adblue pump as well for future reference. The Adblue app and map had placed one there, handy for future reference. Probably also worth mentioning that if you do have a car that uses Adblue and it doesn’t appear to be using any Adblue you might want to get the Adblue tank sensor checked since when the sensor starts reading you might find it’s too late and the car will refuse to start. The costs of Adblue are minimal and you do get a 1,500 mile or so safety warning distance before it will refuse to start. Increased warning as it goes down below 1,500 miles. You get get an indicated range of 5,500 miles on a full 11 litre tank of Adblue. UK filler stop the price are about 70p a litre, you would probably put in 8 litres till filling automatically stopped, making a refill just under £6 at the first warning of 1,500 miles. The range I found is actually more than 5,500 miles on 11 litres, more like 6,500 miles. Spent the first night in Gent where it’s worth mentioning the beauty of the virtual pedal tailgate. There are detractors but the hands free opening of the virtual tailgate is so you can load and unload without putting things down and doing the journey “in one” to the car and from the car. If fully laden it will always reduce the journey to and from the car by one. Handy for loading and unloading the car at each hotel. If you are feeling your age stretching up to whack the tailgate shut which can be painful is also removed with a motorised tailgate. I modded the lock and unlock function to the normal VAG one of one click or door sensor touch to lock / unlock and close the mirrors in or open the mirrors out. Without using the standard Ateca method you are hanging around holding the sensor / button for a couple of seconds to get the mirrors in. Juggling luggage at the same time between parked cars, one touch makes life quicker and easier. As for stop / start that can be modded out if it troubles you on a DSG. In areas of heavy traffic with the engine cutting out and the few seconds of restarting can mean all the difference in a difficult situation. Why most people if they can turn it off via VCDS / Obdeleven do. Never worried me since . Parking is a dream with the 360 degree top view camera and park assist which gives you front assist. Whilst you might not use park assist – I’ve never, the front assist that can only be obtained this way and is very good. The top view gives you a choice of views which are sowed together from four cameras, tail, front and below the wing mirrors. You never or almost never have to get out and move the car since you didn’t get it positioned how you wanted it first time. 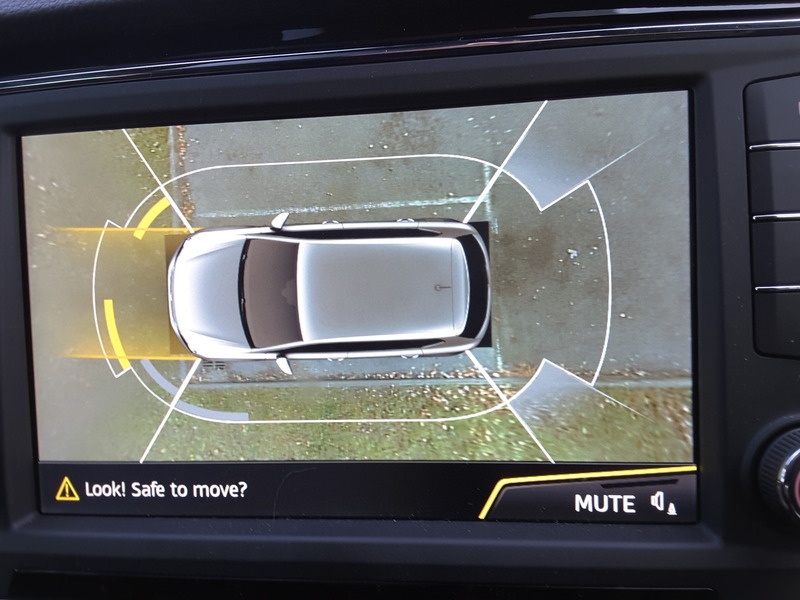 Combined with the ultrasound warnings you can generally park reasonably well although small projections / objects, the ultrasound may not pick up them up. Large objects the ultrasound sometimes can get the range wrong. Generally a loud howling and red on the screen means proceed with care or don’t move the car at all. That facility was useful on single track country roads where the sensors can be used to gauge whether it’s safe to proceed when passing a car at a passing place. Blind spot and rear cross these are packaged together. Blind spot is useful in detecting cars coming past in the “blind spot”. Rear facing radars are built into the car either side which create a flash in the blind spot mirrors. Driving on the continent seeing these warnings gives you extra protection. Rear cross is for when reversing out of a parking spot where an audible alarm is sounded and a red mark is shown on the reversing image to warn of a car approaching. The system uses the same radars, proved to be very useful. Fitted to all Ateca’s is Front Assist which is a radar behind the “S” badge which monitors front collisions with cars or pedestrians. 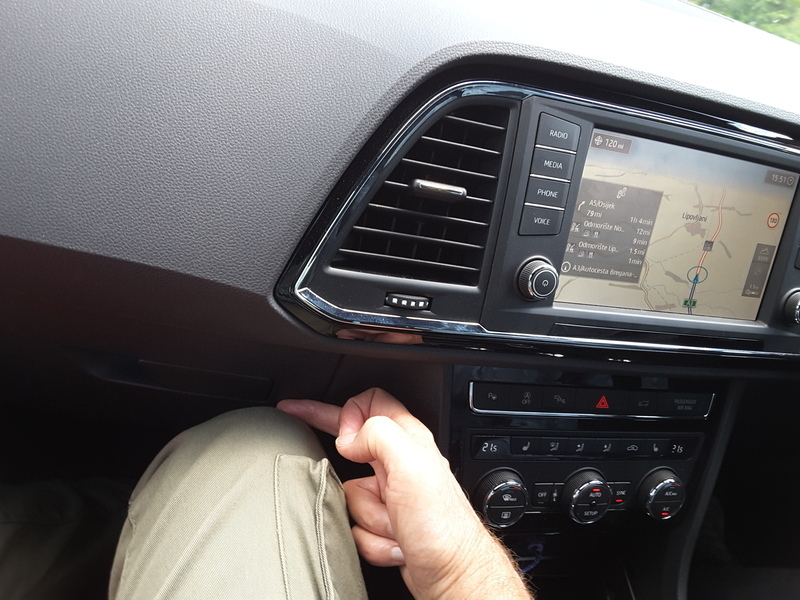 This system perhaps is the most troubling system for owners of the car and has been since it was introduced in the Golf Mk7 in 2013 where much of the Ateca’s system are the same. Any issues with the Ateca you may well find them going back to 2013 in the Golf MQB on boards on the net. The two issues with Front Assist is the system generating the warning ahead of applying the brakes or the warning and braking when there isn’t a problem. Tall road banks, bendy roads with approaching traffic that the radar sees as an issue will lead to warnings. The process can be turned down to “late” in the car’s settings which generally seems to fix these issues. The other issue is in wet weather when the radar detects that it can not function correctly and generates a warning message that front assist is disabled. Once the badge area is dried out, the warning goes away. On the trip there were several incidents of front assist generating the warning message that it was not working in wet spray conditions threw Germany. It also generated an error report in the car’s system that could be read on the OBD port. This was the only error generated by the car in the 3,000 mile trip in 18 days. Very satisfying that the car didn’t pick up any errors whilst away other than the wet Front Assist one. Another front assist incident happened when the co driver was admiring a Ryan air flight coming in at Frankfurt airport in slow moving traffic. The car slammed the brakes on and howled. True ACC could have been used with Lane Assist and the car would have been self driving itself. I tend to have lane assist turned off preferring to drive the car myself picking out the best part of the road to drive on, missing potholes. 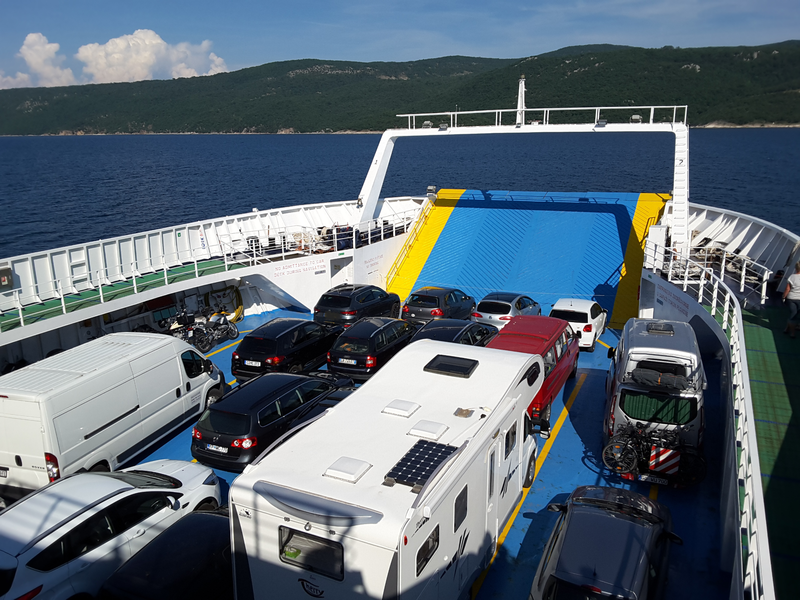 The other front assist incident I had was when driving down a very narrow bendy road to the port for Cres – bit like Italian busy roads that wind. In that incident I had the red warning, not braking, the obstacles it could have seen was a lorry on the opposite side of the road and a rock wall bank on my side as the road twisted and turned, both came into view one after the other – neither of which was in the way of the car based on it’s steering. At the minute I have kept the setting to the normal period, will move to late if I find it can’t handle Welsh country roads with high banks too well. On ACC locking onto the car in front, this runs the risk of speeding with the car in front. It was a function I soon stopped using after I experienced the car going down a hill much faster than I would take it myself as it shadowed the other car and that was at maximum distance. A newer implementation of the system on VW cars which is about to arrive is where ACC is integrated with reading the road signs and maximum traffic speed for the road so as to cap the speed to the legal one. The Ateca system does not offer this at the moment. I loaded up all European safety cameras, using traffic sign recognition and road speed warnings so I drive the car within the warning beeps and bleeps. That works very well to keep within speed limits. silles and kanyewest like this. So how did the car handle on the autobahns at over 100 MPH ? . Very well. Road noise is minimum on 19” wheels. Lack of wind noise and the car is pinned to the road. On 80 too 100 MPH overtaking manoeuvres it does this very well. Fast acceleration with changing down. There are no creaks and groans from the dash or rattles. At one point something did fall inside the dash with a clonk on the return journey, but it was never heard again and everything is still connected (possibly one of those boxes that are suppose to be housed inside the dash which give cause to rattles). The car had four build issues when I got it which took several months to be fixed, fortunately apart from these build issues no other bits of the car have dropped off or have started to rattle. From a drivers perspective the car is very comfortable. From a front passenger perspective it can be pretty uncomfortable as there is a lack of passenger legroom whatever size you are although it does depend what you are use too. Anybody coming from a large MPV needs to checkout the front passenger legroom carefully. 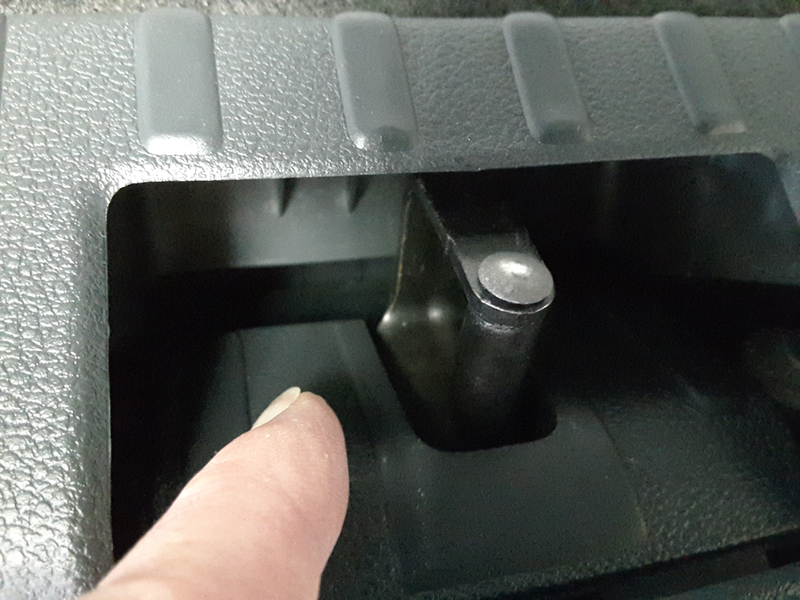 The picture is my leg with the seat fully pushed back and jacked up to prevent backache due to sitting too low – why you buy SUVs and MPVs. It’s obvious looking at the car in the cool light of the day that the glove box is too close to the front passenger seat whilst the foot legroom on the left foot is cramped due to the body of the car in RHD form. You can manage to get comfortable if you cross your legs at the ankles other than that you are sitting with your left foot back, right foot forward – the best you can do. We were averaging six hours of driving per day on three days to get there and three days to get back. So with the co driver you got perfect comfort when driving for 2 – 3 hours and discomfort as a passenger for that time in equal amounts. The Kodiaq the brother of the Karoq which is basically the identical car to the Ateca has no issues on the passenger front legroom so I’m hoping when the car comes out in Seat guise it will inherit the Ateca’s good looks, driving qualities and that extras 30cms in length will go into the passenger footwell as it does in the Kodiaq and an escape route exists. Current plan will keep the car in the family thou. Thoughts of an Arona as a second car have been scrapped given the unfortunate Ateca experience where passenger legroom in the front is a downgrade from my old Altea. On the subject of warnings, if like me you buy your cars and keep them rather than churning them over you might not be use to see so much blatant plastic in the car. Most reviewers picked the car up on the use of plastic. The front plastic is good, once you look down and start moving to the back of the car you see a lot of thin polythene. The issue is that car is made for recycling so the plastic panelling comes out. The Ateca from the boot you are greeted with a very plastic inside bumper tailgate catch area. 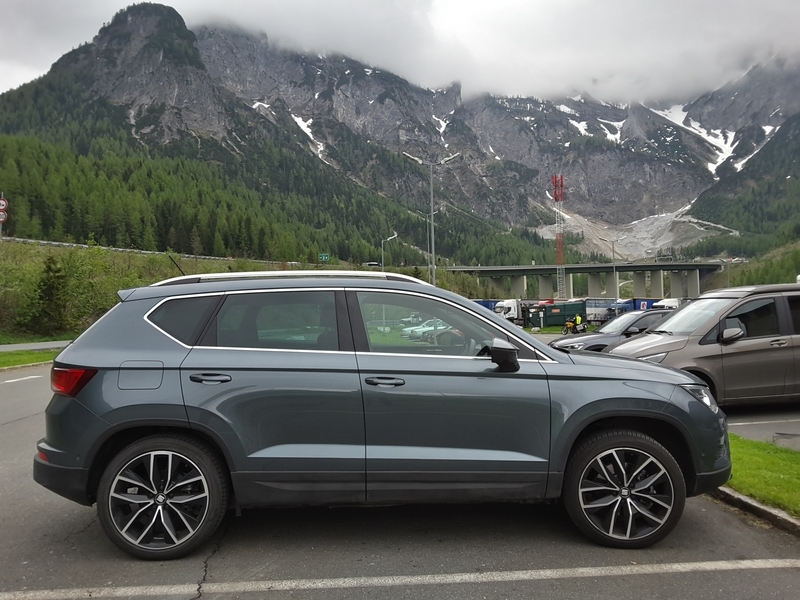 The Ateca and Karoq we get the sight of that nasty top thin edge – my pet hate of the boot – penny pinching where a cover was not provided to finish off the car as they have in the Kodiaq. The launch video of the Arona also shows that it’s going to have that exposed latch area. The Plus has the Juke box which is 10Gb of memory for music and you can use the two spare SD slots for music. I use two 128gb SD cards in the slots for music and keep my electro tango collection on the juke box for non stop tango . The maps are stored on the SSD. As such navigation should be faster together with the processor. It does also have wifi so your phone can act as a media server with the appropriate software giving an additional way to connect. The standard unit is capable of producing “2.5 projection” which I think is this, which shows the overview of a road in a valley. Useful when passing though valleys . The navigation worked very well on the trip. There was one point in Croatia where the road was new so was not on the map. Google also had an issue at that point as well, so resorted to running Google and the car’s navigation till we were back on route again. Trying to find the border road with Hungary rather than coming back on the toll road. The car’s system can sometimes take you on the direct route which may not be the one you want to do, you can edit and drag the route. The three route selection you have to be careful with since at home you may go for the non direct route whilst away you may wish to go for the fast route. I have kept the three routes as an option rather than suppressing that option which is a user choice. The coordinates / destination you can take from the POI database if the destination is in there. Before leaving I checked which were in the Here Maps app and also put them into Android N45, E25 app which is capable of generating the degrees, minutes, seconds coordinates (DMS) which the car takes via new destination, on map and enter via the thumb wheel. Sitting out with the car I entered the hotel location either via the car’s POI database or as DMS. To go for the full approach I also upload the coordinates to user POIs as a separate import file to go with the safety camera upload. This gives you the user destinations POIs marked up on the map and if you ever change cars or the car’s navigation system crashes you have the POI file to upload and turn back into the car’s destination folder. That task is just picking off each user POI on the screen and saving it as a destination. 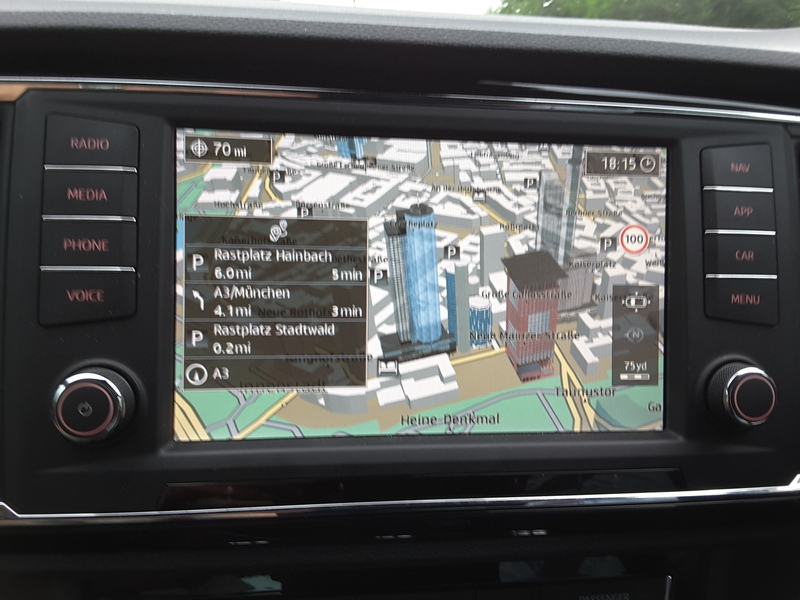 At that point the car’s screen starts to resemble a standard navigation system of showing “favourites” marked up on the map. For hiking, generating the DMS for the car with N45, E25 Android app worked very well. Your hiking route is on your hiking app (where I’ve digitised the walking track) so either you extract out of there and punch it into the car (thumb wheel) if in DMS, or do a code conversion from decimal degrees to DMS. N45, E25 shows both Google Maps including StreetView and crowd sourced Openstreet Maps. It turned out that I could just compare the two Openstreet Maps and just pick it off. 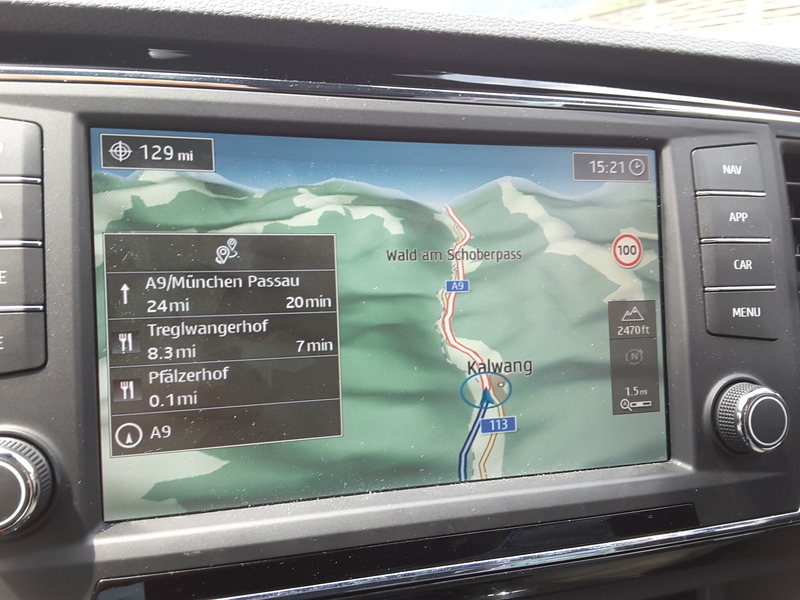 This one was always an issue when I was getting the car as to how easy was it going to be to find hiking spots and visitor spots on the car’s system from the general purpose Windows Mobile app I use for hiking and my old satnav. Wasn’t a problem, the N45, E25 app fills the gap in generating DMS coordinates. For any outdoor activities where you use Android and the car’s inbuilt system I can recommend the app. Coming from standalone navigation systems and ones on mobile phones and using built in system on rental cars. The issue with Google obviously is if you don’t have a mobile signal, the details it throws up and the satnav signal jumping about. Car systems cope better when the satnav signal drops away as they measure the cars movements from when the signal drops away (tunnel say) and the wheel revolutions so you don’t get the classic issue of missing a road junction in a tunnel or at the exit of a tunnel. Experienced that on many road trips in Europe. On the Seat Sound System itself there are some detractors of this option. Basically it offers good value in that you get the spare wheel with the subwoofer in it and an extra midbass speaker that is placed in the centre dash. If you don’t buy the Seat Sound system you won’t have the centre speaker area or the subwoofer obviously. People with the standard system have commented that the door speakers rattle to high volume. Distributing the power around the car with 10 speaker system will obviously reduce the need to adjust up the volume. Some adjustment of the equaliser to get your personal tastes is most likely to be required. Playing London Grammar say throu the Seat Sound System you can certainly pick out the “walking bass” in the centre front speaker and rear subwoofer. Without the Seat Sound System you are reliant on the side speakers to do the best they can with low frequency sound. If listening to speech radio is your thing in the car then you probably don’t need the 10 speaker system. So how did the black leather upholstery cope with the heat or us sitting on hot seats. UK Xcellence come with black leather seats, no other option. Personal belief Seat UK’s approach is since 90 percent of the car’s (or there abouts) aren’t owned by the punters but are owned by the VAG group in the UK then to retain second hand value they only rent them out in leather, knowing they can wash them down and sell them on. 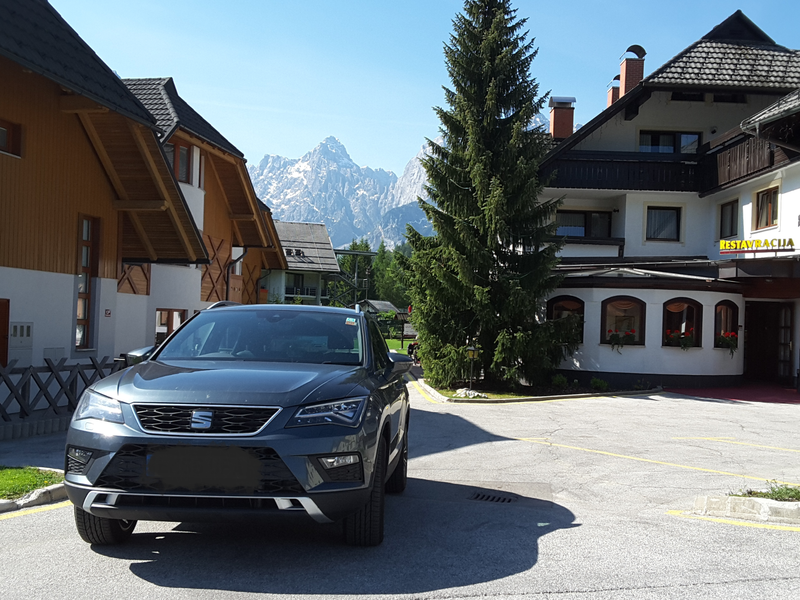 The vast numbers of Ateca’s shipped in the UK are Xcellence’s. Obviously if you are buying the car outright it’s frustrating that you can’t buy what you want. By the same token I suspect why Ateca’s have fast delivery to the UK as opposed to the rest of Europe may well be that the VAG group find the financial instruments around these cars generating a three year income stream works for them, it must offer them a near guaranteed income profile if the customer doesn’t fault…. Thinking more in terms of their own finances for loans etc. They pack down to about an 8” square package by ½” depth. Like photo reflectors a twist action is used to collapse them. There is a circular wire that keeps them in shape and the cars visor closes down on them to hold them in place. If you know that you are going to use them again on the day you can leave them in the back open. That’s placed where you know the sun will fall as the day progress whilst you are out hiking. If you forgot to put up the shades you sit on the towel so you don’t burn your bum on the leather. 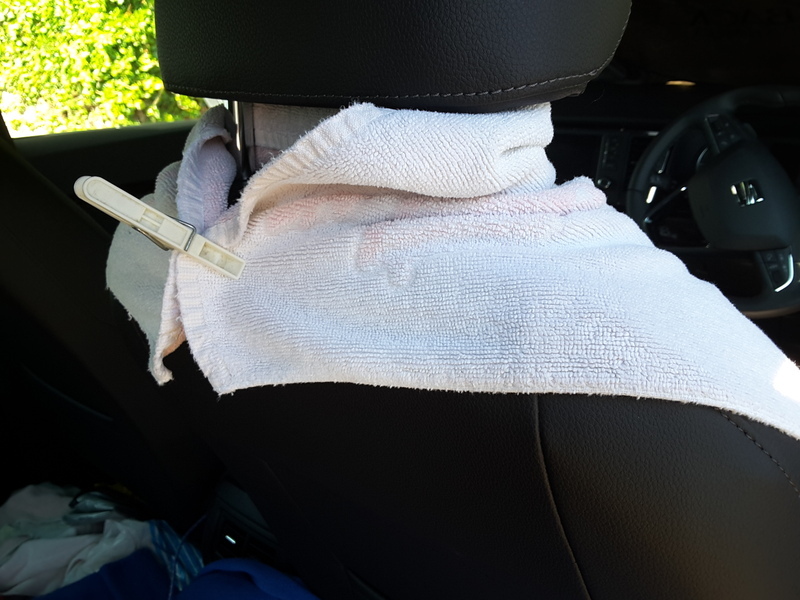 One good thing about the car getting very hot during the period the leather seemed to get stressed or the seats so at last the seats feel like bucket seats where they hold you laterally which is what you want if you suffer from backache. It took six months for that to happen but think it was the +50’C temperatures in the car parked up that finally caused the leather to give way or the bolster. Fuel consumption on the journey the 2.0 litre diesel, 190 4Drive gave a reported 44 MPG, probably 42 MPG actual, taking into account the over reading you get via the car’s system. This is a very good figure given the speed that it was being driven at during the trip. I have always found the DSG works fine. Keep it in normal setting, don’t use the paddles or gear +/- to override. Pull off fairly gently, no jerk from the automatic handbrake. If you pull away quick then you will feel the handbrake and the gear change is jerky which you would expect if you put too much power on with a 190 BHP engine. Lastly, little dirt came in through the rear wheel arch for those people preoccupied with that aspect of the car. Nice and clean when one got back. We're waiting for Brexit to resolve itself before going back into mainland Europe then probably Croatia again, make do with Ireland in the meantime. Don't fancy waiting in queues at Dover and Dunkirk. Fair journey you do, break ours into chunks although living in Wales now an extra chunk. 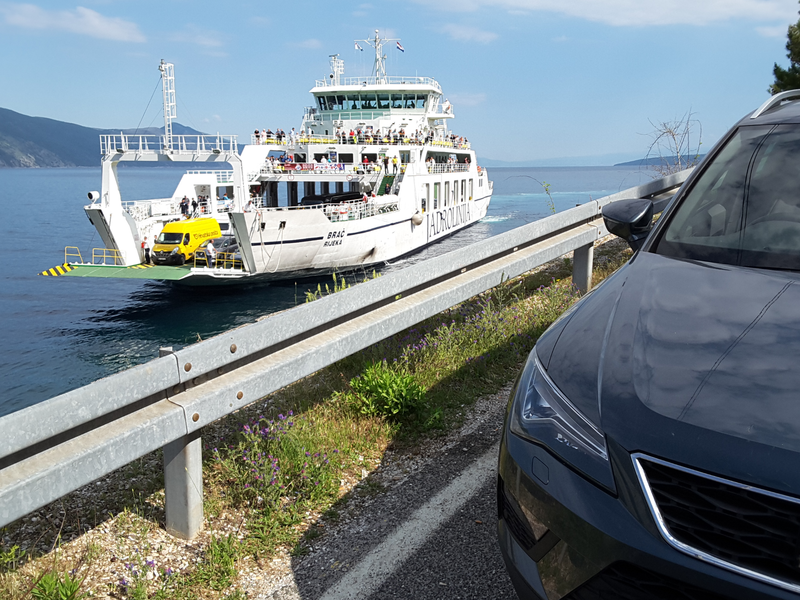 No didn't see any other Ateca's on the journey although there were some Leon Cupras on an outing queuing for the Cres ferry. BTW you will get that nice flap on the boot catch cover as the Kodiaq... seeing the naked thin plastic use to anoy me. Be interesting if they penny pinch on that. Ha Brexit. You got a point but tickets for Channel tunnel have to be bought now Otherwise it gets too expensive. 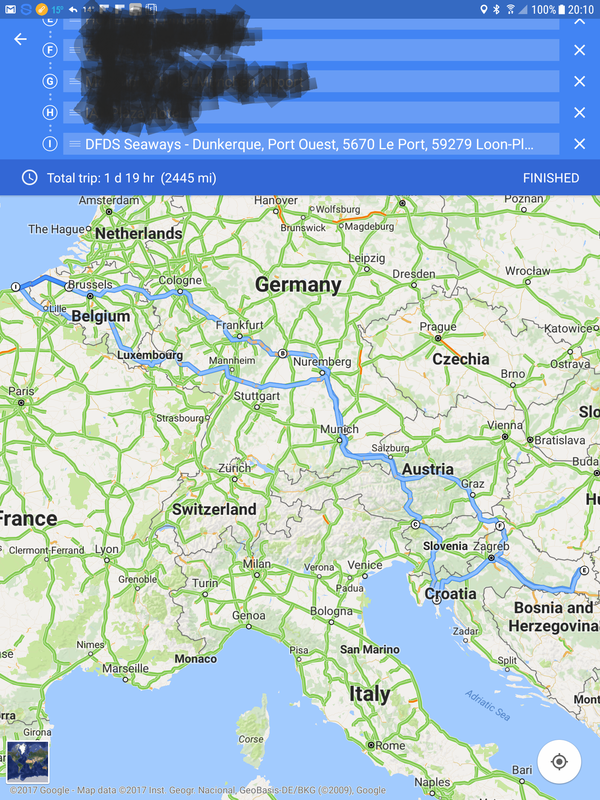 We spend approx £500 on petrol, one nights sleep, tolls and tunnels minus food on a return trip so much cheaper and more interesting than flights for 4. I'm a regular to Germany but this year I'm doing MK to Modena via Koln and Stuttgart. No flap, the metal catch is bare naked. Penny pinching again. I never checked when I looked at it. Suspect you don't get the ice scraper holder under the filler cap as per the Ateca. The filler cap flap shares the same part number as Skodas so expect VW dont fit them. 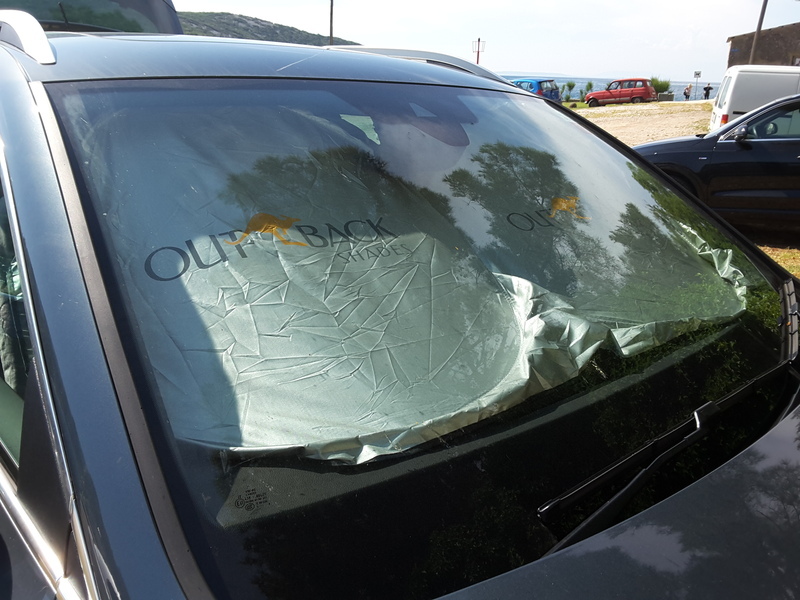 I think this is where the missing heated windscreen went from the Tarraco range ?. Which ice scraper fits this or was it missing when I took delivery ? It was an amusing bit they left off the Ateca's. Then Seat subsequently started to have them made in red with Seat badged on them. You didn't feel complete unless you had one . Mind you they did say that the Ateca 2016 was full LED they forgot the fogs, the rear indicators, and reversing lights. Seat still promoting the Navigation Plus as having a hard disk drive when it's an SSD. They are a bit sloppy with their spec descriptions. Photo in Skoda green... you never know when you might want it. Funny you should ask, the scraper never appeared in the parts catalogue at launch but you could get the Skoda one from Skoda parts desk. Then Seat relented and had their own made in red as I just said. Don't know what the part number for that was but the Skoda one is here in the picture. It fits, they are the ones that go into that slot. I haven't really promoted them on here since they are a bit whimsical . Its a nice touch thou to know what that bracket is for and why its there. Also there are belts for the triangle kit, top right in the boot hidden below parcel shelf mount. Dog guard things further up in the car but never sussed them out not having a dog. Is there some explanation why it has this green color? Probably so you can see it when you drop it in the snow and sinks. The Seat scraper version is bright as well. The partner number can be read in my picture... that Skoda link may be a different one. I'm sure I didn't buy it at those Seat part prices, just phoned the local Skoda dealer and they got it in post free. Cheaper than using Skoda parts mail order.